One of several outstanding Texas-based jazz and dance bands to make records in the years preceding World War II, the Harris Brothers Texans demonstrated themselves to be formidable music-makers, but with only three records to their name, all of which are rarely encountered today, the band is shrouded by a veil of near total obscurity, unknown to most outside of a small cadre of vintage jazz aficionados. Previously, scarcely any information regarding them was available. Now, following intensive research, I have endeavored to piece together a short but relatively comprehensive history of the band herein (at least the most extensive one hitherto published; with special thanks to the research of the late Murray L. Pfeffer and his Big Bands Database). The three Harris Brothers were Abraham “Abe” Harris, born October 12, 1890 or ’91, Louis Joseph “Lou” Harris, born in October of 1891, and Myer Isadore “Monk” Harris, born January 9, 1894, the sons of Emanuel and Sarah Harris of Navasota, Texas, descendants of Jewish Prussian immigrants who arrived in Texas in the 1870s, by way of South Carolina. Abe Harris was a drummer in the First World War, and after his completing his service, he started a jazz band with his brothers, Lou playing trumpet and Monk playing trombone and euphonium. Originally directed by Abe, Lou Harris assumed leadership of the band by the late 1920s onward, and it was apparently fronted for a time around 1926 by reed and violin player and singer Harry Samuels, who had been a childhood friend of the Harris brothers. The Harris Brothers Orchestra played in Corsicana in 1922, before taking up in the Houston area the following year, making them contemporaries of Lloyd Finlay’s orchestra, and in 1923 and ’24, they played in the ballroom of the Crystal Palace in Galveston. In the middle part of the decade, the Harris Brothers Orchestra relocated to north Texas, where they broadcasted from WFAA in Dallas and were engaged at the roof ballroom of the Baker Hotel in Dallas beginning in 1926 and at least as late as 1929. When the Brunswick-Balke-Collender Company made their field trips to record in Texas, the orchestra cut records, resulting in three sessions, all in Dallas, yielding a grand total of eight sides, six of which were released. First in October of 1928, they recorded the hot jazz tunes “Somebody Stole My Gal” and “The Pay Off”, released on the Vocalion label. The following year, they cut “Gut Bucket Shuffle”, “Louisiana, That’s My Home”, and two unknown unissued titles. Finally, they concluded their brief recorded legacy with two pop-styled songs: “Oh How I Cried the Morning After” and “The South’s Been a Mother to Me”. Though credited on their records as the “Harris Brothers Texans”, at home the band was simply called the “Harris Brothers Orchestra”. By this time, the Harris Brothers’ musical style was comparable to that of the contemporary Phil Baxter’s orchestra and other Texas dance bands of the era, featuring a rather loose instrumentation and a “big” sound punctuated by strong “oom-pah” bass rhythm, with occasional use of accordion, somewhat evocative of Texas’ polka bands. Much of their recorded material displayed a certain uniquely Texan character. An unidentified group called “The Harris Brothers” had two test sessions for Gennett in 1928—prior to any of the Harris Brothers’ Brunswick recordings—but given that they are believed to have been a vocal group, it is doubtful that they were one and the same. Around the same time as their Brunswick engagement, the Harris Brothers Orchestra played at the Dallas Country Club, and they were engaged at the Adolphus Hotel in Dallas in 1929 following Alphonso Trent’s tenure there. During their time at the Adolphus, bandleader Lou Harris gave a large quantity of arrangements to New Orleans expatriate Don Albert, who had recently parted ways with Troy Floyd’s orchestra and was starting up his own band. The band remained together under the directorship of Lou Harris at least into the late 1930s, playing in Dallas and Abilene—perhaps even venturing all the way to Hollywood on a 1935 tour—and they provided music at the Greater Texas and Pan-American Exposition at Dallas’ Fair Park in 1937. Myer Harris eventually retired from music and built homes in Dallas. Abe Harris died on May 23, 1960, Lou in 1969, and Monk on November 8, 1990, all three in Dallas. Brunswick 6047 was recorded in November of 1930 (though some sources suggest a January 1931 date) in Dallas, Texas. The personnel of the band probably includes at least some of the following members: Lou Harris and Paul Skinner on trumpets, Myer “Monk” Harris on trombone, Harry Samuels, Gene Hammel, and probably at least one other—possibly Robert Dean—on reeds (clarinet, two alto saxophones, and tenor sax), Murray Lambert on piano, Liebling Mayo on banjo (though Johnson and Shirley’s American Dance Bands suggests a possible Lester Peacock), an unknown tuba player, and Abe Harris on drums. The vocalist may be reed man Harry Samuels. First up, the Texans play a hot jazz arrangement of “The South’s Been a Mother to Me”, apparently the only recording of this song. 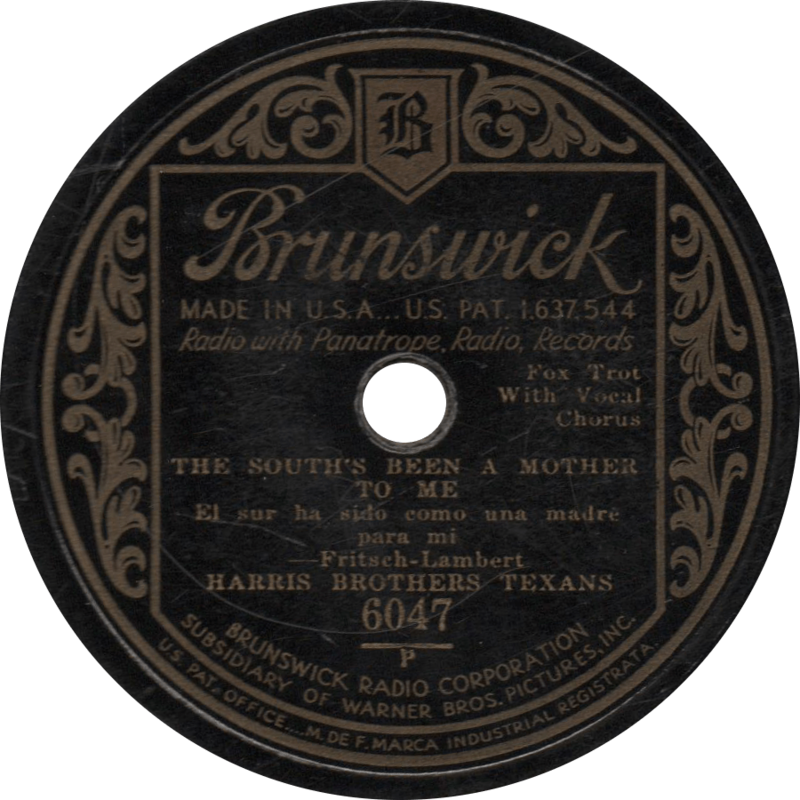 The South’s Been a Mother to Me, recorded November 1930 by the Harris Brothers Texans. On the flip, they maintain their booming sound on William Gould and Joey Ray’s popular song “Oh How I Cried the Morning After (The Night Before With You)”. 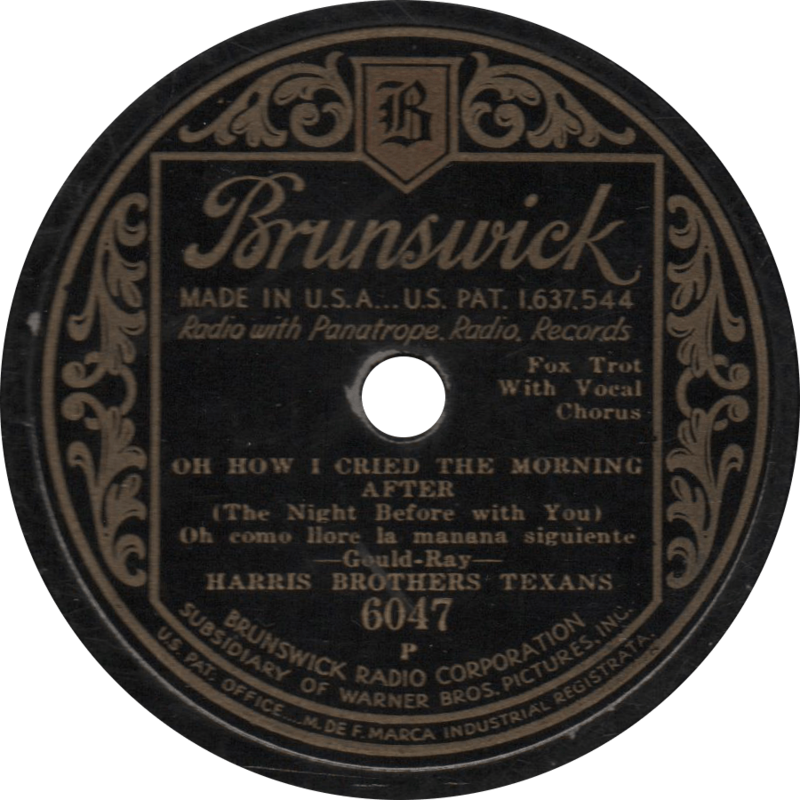 Oh How I Cried the Morning After (The Night Before With You), recorded November 1930 by the Harris Brothers Texans. This entry was posted in Records and tagged 1930, 1930s, Abe Harris, Brunswick, Dallas, Dance Band, Field Recording, Gene Hammel, Harris Brothers Texans, Harry Samuels, Jazz, Lieb Mayo, Lou Harris, Murray Lambert, Myer Harris, Paul Skinner, Popular, Territory Band, Texas by R. Connor Montgomery. Bookmark the permalink. I am trying to find some facts about an obscure band, Cline’s Collegians of which I have a rare personal Brunswick of “Chickadore Stomp” recorded in Dallas. The trumpeter is clearly the same as on the Harris Brothers’ “Gut Bucket Shuffle”; do you happen to know anything about him or about the connection between the two bands? Durward Cline was born on October 3, 1902 and started his band, I believe, at Southern Methodist University around the middle of the 1920s. He continued to lead bands in Dallas at least into the 1960s, and frequently broadcasted on WFAA. Cline lived his entire life in Dallas, and died on April 14, 1982. Lou Harris was the main trumpeter with the Harris Brothers’ band, and Paul Skinner was also reported as a member around the time they made their records. Ed Miller and Oran Barnett were also listed as trumpet players with the Harris Brothers earlier in the 1920s, but as far as I was able to ascertain, they were no longer involved by the time the band recorded. Apparently banjoist Liebling Mayo did play in Cline’s Collegians while attending SMU in 1925 before playing with the Harris band later in the decade, but I haven’t (yet) been able to unearth any further connection between the two orchestras other than that they were both based in Dallas at the time of their recordings. Thank you for publishing the only information on this band that I have been able to find online. I am looking for specifics regarding shows played by the Harris Brothers Texans in Central Texas in the late 1920’s, possibly early 30’s. Any assistance would be greatly appreciated. You guys are partly right with your information. I sent Murray a pictue and some info about the Harris Brothers. I also have several recordings that were never released. I am hesitant to post anymore and especially the recordings as I see some folks are profiting from this. One person has even taken a cooy of the Brunswick promo picture I posted and made an cd cover and is selling cds. Monk Harris was my grandfather and started building houses in 1921. Lou was an engraver along with playing music.